In this tutorial, we’ll cover control flow protection guarantees provided by WebAssembly, known weaknesses, and how to use clang control flow integrity (CFI) in WebAssembly programs to mitigate some risks around control flow hijacks. Along the way we’ll hijack the control flow of a sample WebAssembly program by exploiting a (contrived) type confusion vulnerability. We’ll be adapting some code from the ”Let’s talk about CFI” Trail of Bits blog post series — if you are unfamiliar with control flow integrity the Trail of Bits blog series is a good place to get started. This is part one of a two-part blog post on some security-related aspects of WebAssembly. Part two of this series will discuss an incomplete-but-interesting set of security topics around WebAssembly embedders — that is, the software that provides an environment to run WebAssembly guest programs, namely browsers. Note that this blog post does not include a detailed explanation of how WebAssembly works. If you are unfamiliar with WebAssembly you can check out webassembly.org, the official developer’s guide page, or search the web for one of the many available introductory blog posts, tutorials, and videos to learn more. WebAssembly is an open, industry-wide effort to bring a safe, efficient assembly language to the web. WebAssembly technology is developed collaboratively by major browser vendors like Mozilla, Google, Microsoft, and Apple, as well as non-browser web technology companies like Fastly. WebAssembly modules can be downloaded and executed by the majority of browsers in use today. Large development efforts like AutoCAD, QT, and others are increasingly leveraging WebAssembly to deploy speedy and safe apps built from unified C/C++ codebases across desktop, mobile and browser platforms. The WebAssembly ecosystem is growing rapidly, with new tools, applications, and ideas being announced regularly (for example here is one of several curated lists). WebAssembly is the logical successor to Google Native Client, a performant software fault isolation technology that allowed developers to deploy native applications to Google Chrome. WebAssembly provides an elegant design that has benefited greatly from the lessons learned from Native Client, with highlights including a sound type system that fits on a single page, control flow integrity, limited/local nondeterminism, memory safety guarantees, and more. For details on the design of WebAssembly, check out the 2017 PLDI paper or webassembly.org. The WebAssembly design supports memory safety to avoid inheriting some of the endemic problems that can come C, C++, and other potential source languages. The next section discusses this facet of WebAssembly. The WebAssembly Memory Safety security documentation explains why many classes of memory safety bugs and associated exploit techniques, like stack smashing, ROP, etc. are obviated in WebAssembly programs. That means, assuming the program that compiles and runs the WebAssembly code is correct of course, these attacks are not possible. This is really cool, and standard fare for the extremely well thought-out WebAssembly architecture. We can explore the practical implications of this design through a type confusion exploitation scenario. We’ll use a simplified C++ virtual call type confusion example program from the ”Let’s talk about CFI” Trail of Bits blog post series as a running example. The concept in this example is that the attacker somehow tricks the program into calling a method on an instance of the wrong type. This occurs in all sorts of ways in the wild (and is not limited to C++), but one common scenario is when the program reads an instance (or instance selection logic) from an untrusted data source (such as the network) and, without checking the instance is of the expected type, calls some object method (or function) on it. If an attacker can feed the program an instance of an unexpected type, they can sometimes take control of the program (or cause other bad things to happen). The changes made to the Trail of Bits code will be covered below; you can find the code samples used in this tutorial on Github. This section explains tool setup in case you want to play along at home. If not, feel free to skip this section. We’ll use a Docker Ubuntu 16.04 guest to compile vulnerable code to native and WebAssembly targets. We’ll share a directory so we can use the tools installed on our host to edit files and use a host web browser to execute WebAssembly. In the next section we’ll demonstrate exploitation with these programs. You can see from the output above that the vulnerable program was exploited; the attacker makeAdmin payload executed. This is possible because the native machine code doesn’t include any checks on the function parameter types at runtime — the “evil” function runs unabated (though with funky results, since the function considers the supplied integer to be a float). Accordingly, the type check fails in this case because because the two functions have different signatures in WebAssembly: the “victim” function takes a float (f64) while the “evil” function takes an integer (i32). Note that while the WebAssembly program will halt and trap at this point, the fault will be isolated to the WebAssembly guest program instance by design. This means the browser process that hosts the WebAssembly can keep sailing along safely without having to worry about memory corruption or similar. WebAssembly provides an elegant safety design including a sound type system. One of the side effects of this design is that (as of this writing) WebAssembly provides few value types: i32, i64, f32, and f64. This means that all value types from the source language (C or C++ for example) map down to these types, and that these are the types that WebAssembly uses for indirect call type checking. Correspondingly, this means that in our running example, an attacker might be able to hijack the control flow of the victim WebAssembly if they can manage to supply a function whose WebAssembly type signatures match (as discussed in the WebAssembly memory safety documentation). Once again, in the next section we’ll demonstrate exploitation with these programs. You can see from the output above that the vulnerable program was exploited; the attacker makeAdmin payload executed. This is possible because the native machine code still doesn’t include any checks on the function parameter types at runtime — the “evil” function once again runs unabated. This is because the C void* and int types both map to the i32 type in WebAssembly (note that WebAssembly programs use 32-bit addressing — for more information on this topic, I recommend the 2017 PLDI paper). So, while WebAssembly checks the function signature of the function it is about to call (that is, the WebAssembly types of the function parameters and result), the two functions have the same signature so the exploit runs successfully. As we observed above, while the simple type system of WebAssembly yields tremendous benefits, one of the downsides is that type confusion vulnerabilities can still occur. Fortunately, just like in native executables, we can compile WebAssembly code with Clang CFI checks. As discussed in the WebAssembly memory safety documentation, this both helps defend against the code reuse attacks we are exploring here and uses the generally-finer-grained C/C++ types for other function signature checks as well. Ultimately this means is that clang CFI checks can be compiled into the WebAssembly program and enforced in the embedding (i.e. browser). Pretty cool! We can see from the output above that clang CFI works as intended — the exploit is blocked. We can see above that the clang CFI enforcement occurs in the browser(! ), thwarting the exploit. 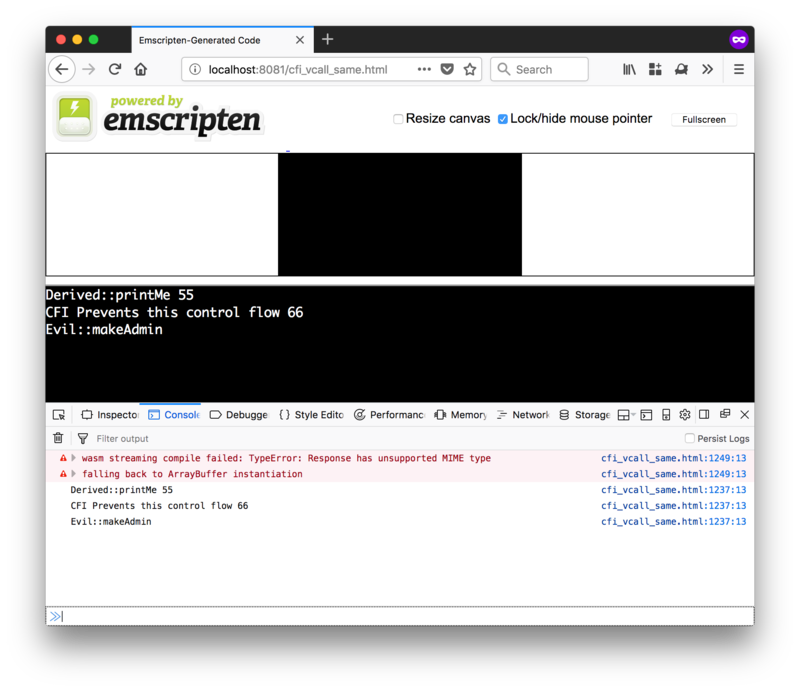 In this blog post we showed how to hijack the control flow of a sample WebAssembly program by exploiting a type confusion vulnerability, demonstrating some of the memory safety guarantees provided by WebAssembly along the way. We also covered using clang CFI to strengthen WebAssembly programs against these classes of attacks. Overall, WebAssembly is a well-designed technology that provides a great baseline for secure development; hopefully this tutorial and discussion illustrated some security aspects of the ecosystem. 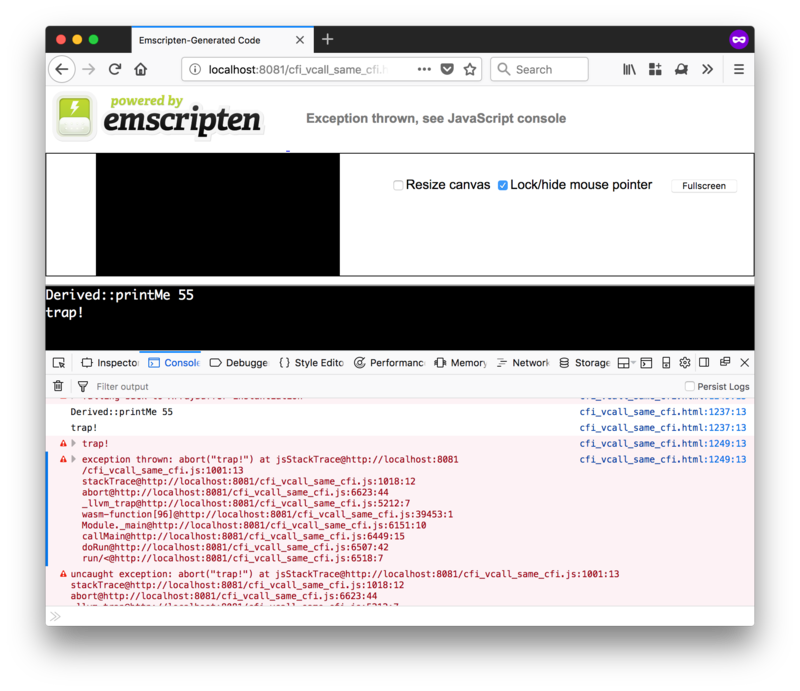 Stay tuned for part 2 of this series, which will discuss an incomplete-but-interesting set of security topics around WebAssembly embedders — the software that provides an environment to run WebAssembly guest programs, namely browsers. Jonathan Foote is a security engineer at Fastly where he focuses on application security and R&D.